How Do You Spell UNDERSTUDY? Correct spelling for the English word "understudy" is [ˌʌndəstˈʌdɪ], [ˌʌndəstˈʌdɪ], [ˌʌ_n_d_ə_s_t_ˈʌ_d_ɪ]] (IPA phonetic alphabet). 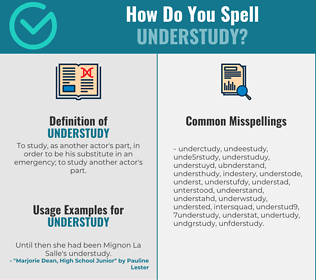 Below is the list of 410 misspellings for the word "understudy". To study, as another actor's part, in order to be his substitute in an emergency; to study another actor's part.